Spy v. Spy - Clovis, California Prospecting For Businesses in Elk Grove? 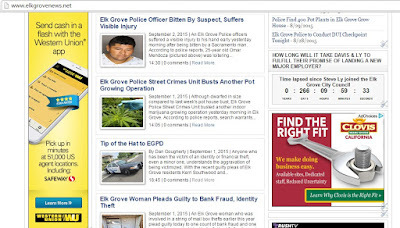 Over the last few days an unlikely advertisement has been appearing on our view of Elk Grove News - an ad from the City of Clovis' economic development department. The ad, which is placed on EGN through our Connecticut-based advertising intermediary (see screen shot below), has the tagline Find the right fit, we make doing business easy. Obviously the algorithm placed the ad on EGN based on our viewing habits and the contents of the page. 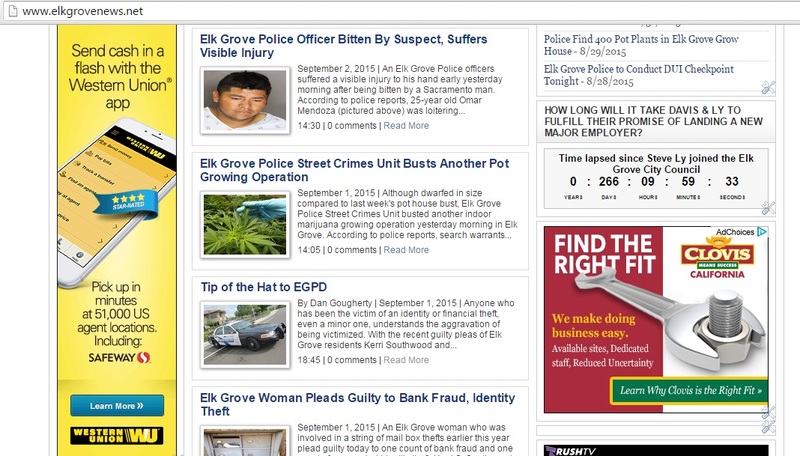 Clicking through the ad takes the reader to the clovis4business.com page. Placement of this ad by Clovis, which can set some insertion parameters for what website it will appear on, shows just how competitive the game of attracting businesses and the jobs they bring to a community has become. 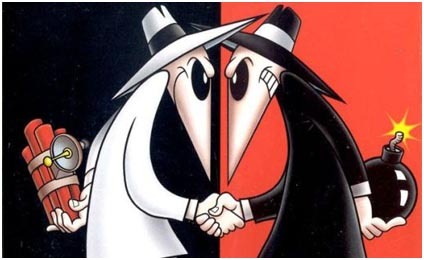 At some point, when California cities are competing with one another, it becomes a zero-sum game not unlike the Mad Magazine's Spy vs. Spy comic strip. Indeed, the competition for jobs is not a regional, statewide or even a national game, in today's world the game is played on a global scale with the strings being pulled by multi-national corporations. As for Elk Grove, lets hope our city councilmen can use the resources taxpayers have entrusted them with and work on economic development ideas that plays to our area's heritage and strengths - not some phantom development scheme. Wasn't it enough that Clovis stole Elk Grove High School Thunder Herd football coach Ed Lombardi, but now they are going after our smoke shops, nail salons, liquor stores and fast food joints? Just keep your cotton pickin' hands off our malt shops! The bread and butter voters of our present councilmembers in EG are the government workers (state, federal, school, city, etc.). This sizeable block of voters have job security, livable wages (guaranteed monthly salaries) and wish to keep their suburban lifestyle intact. All this talk about jobs and the jobs/housing balance is to placate the local regional agencies who dangle grant money in front of the city. Make no mistake about it: The government workers are not going to quit their career jobs to switch to a new employer, and the chances of the city landing a major employer who will attract new immigration into our fair city is about as good as thinking these government workers will ride light rail! So, it may be "Grow Time", but in reality, it is "Business as Usual" with extra emphasis given to job soundbites. By the way, when was the last time our new Economic Development Director gave a status report to the Council? Business as usual will mean thousands more bland tract homes in bland subdivisions all built during the worst drought in recent history. The upcoming El Nino will only be an aberration and not the norm. NO MORE NEW HOMES! Why should I have to kill off my lawn so the greedy developers can throw up more tacky characterless homes?